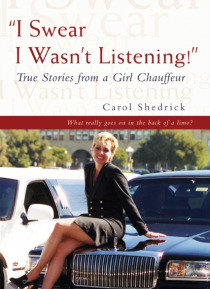 Chauffeur Carol Shedrick stepped out of her limo on a busy street on a Saturday night. She was ready to open the back door and let out her neighbors and their friends who had asked her to take them out for a night on the town. Suddenly Mr. Neighbor thrust open the rear door of the limousine, and Shedrick stared in shock. In the back of her limo sat six naked people, including her neighbors. As a c… hauffeur for many years, Shedrick often drove for celebrities and government officials from America as well as other countries. In "e;I Swear I Wasn't Listening! "e;, she shares the most interesting, touching, and hilarious true stories from the regular, everyday clients to those who were celebrating special events in their lives from the back of her limousine. Shedrick will have you laughing at the antics of crazy women and a birthday party for a ninety-year-old grandfather, and her poignant description of a marriage proposal on a cliff high above town will tug at your heartstrings. Whether you are a Don Juan wannabe who wants to charm your lady or a group of friends out for a good time, remember your chauffeur just might be trying not to listen!